Yorkshire Decorative Glass works with Architects, Interior Designers and direct with client teams on nationwide projects for blue chip companies and public organisations. We are used to working with big brands and achieving the highest quality that reflect the client’s brand values. We can advise on the suitability of glass finish for your project, turn your artwork ideas into reality, provide samples/drawings prior to project commencement and we will happily work with customers own glass – or we can supply. Our range of glass finishing services includes sandblasting, acid etching and painting. We also work with mirrored glass and we can apply Ritec ClearShield® protective coating on decorative and patterned glass solutions if required. 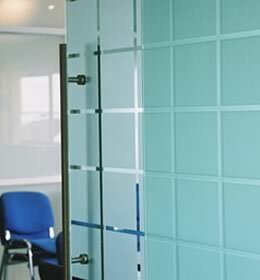 We also supply sandblasted glass stock sheets nationwide to Glass Merchants. Contact us for more information.